Have you ever been typing and accidentally erased a section of your document? Or perhaps you collaborate on multiple drafts but need to go back to the original or previous draft? Using Google Apps, this is (mostly) not a problem anymore due to a feature called Version History. Google auto-saves periodically while a user is signed into their apps (generally every minute/few minutes depending on connection/typing.) It creates a sort of “save point” (called a version) that can be referenced later if necessary. See who contributed to a document (and when) – You can see who made what change and when. This is helpful for seeing group participation. 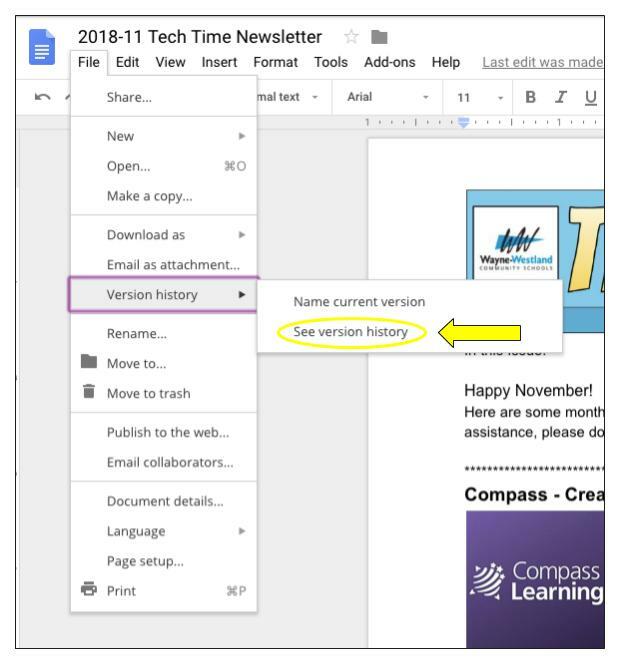 When working on a shared document it can be difficult to remember who made what change and this highlights when the change was made and who was responsible for that change. Name different versions – Students can use this to help identify parts of the writing process. By naming a version they can identify which point was a “Rough draft”, 1st/2nd Edit, and Final copy for the teacher. 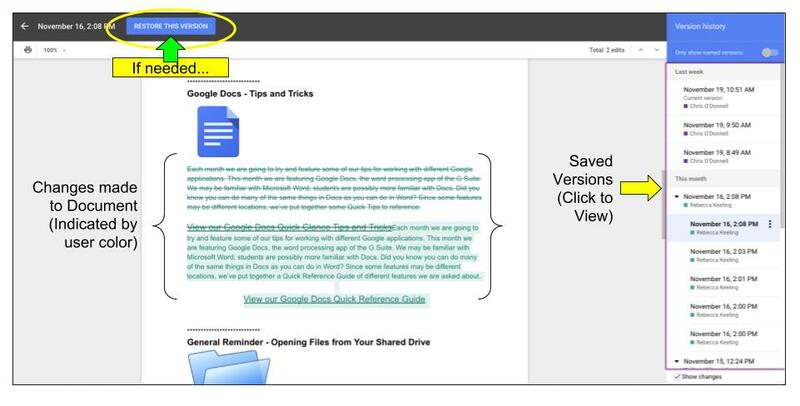 Available on many Google Apps – This is an option on some Google Apps including Docs, Sheets, Slides, and Drawings. Click the dropdown arrow to the left of the version date to see when changes were made (and who was editing the document at the time). Different editors will appear as different colors. If needed, find the Version you wish to go revert to and choose the “Restore Version” button at the top of the page. If you are do not need to restore a version, click the upper left arrow to return to your document. As always, if you have any questions about this, please contact the Instructional Technology Coaches.